Hi, my name is Ouisar-san and I`m a wedding stalker. 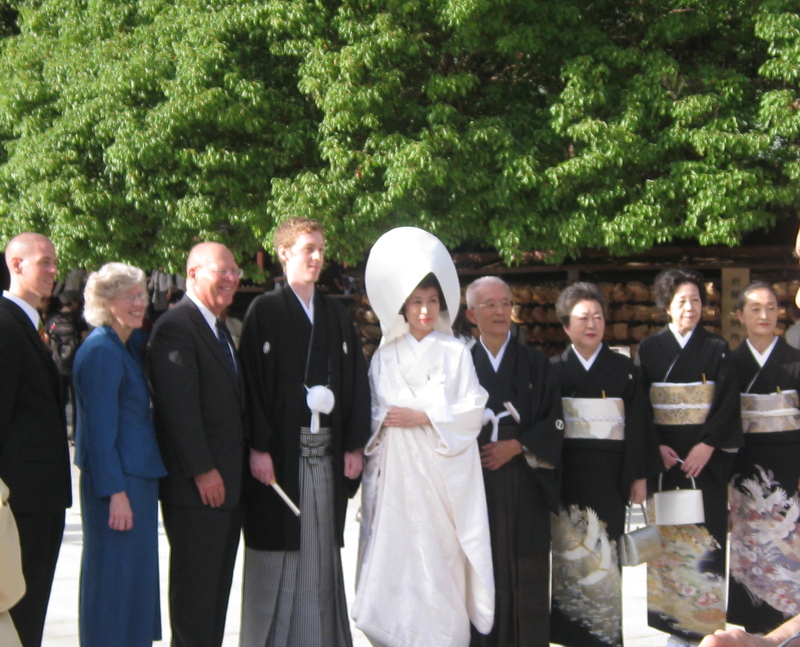 I have a fetish for Japanese Shinto weddings. The urge to ambush elated couples during their nuptial celebration stems from experiences as a child. I don`t recall which ones exactly. To clarify, I`m not interested in the Western Style wedding characterized by the white ball gown and tux in which many Japanese also participate on the path toward marriage. 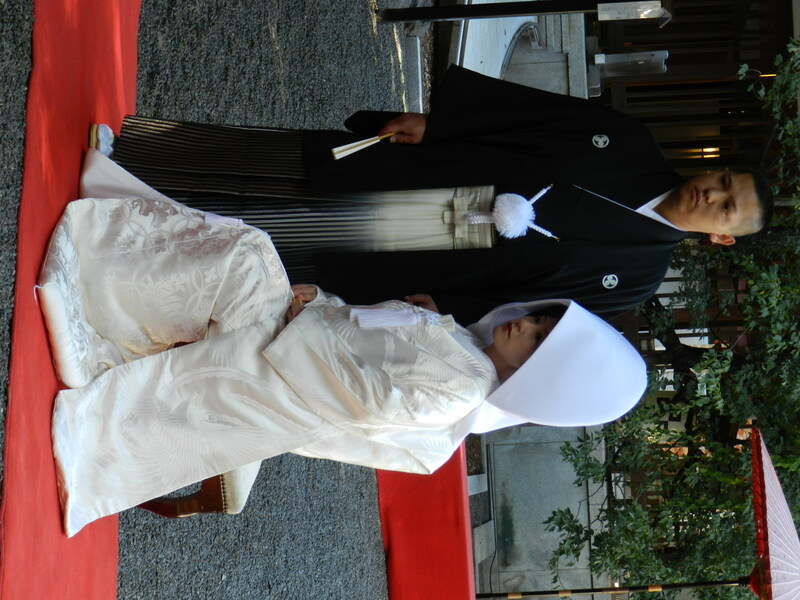 No, the blissful couple need only to worry about my presence at their second ceremony- the Shinto rites. For nosy individuals such as myself, the opportunity to poke my protuberance into the private lives of strangers is too tempting to leave alone. After a year in Japan, I optimize my chances of stalking success by timing the visits to Meiji Shrine at 11:00 on weekends. I hide in front of the ceremony building in order to capture action shots of the procession. 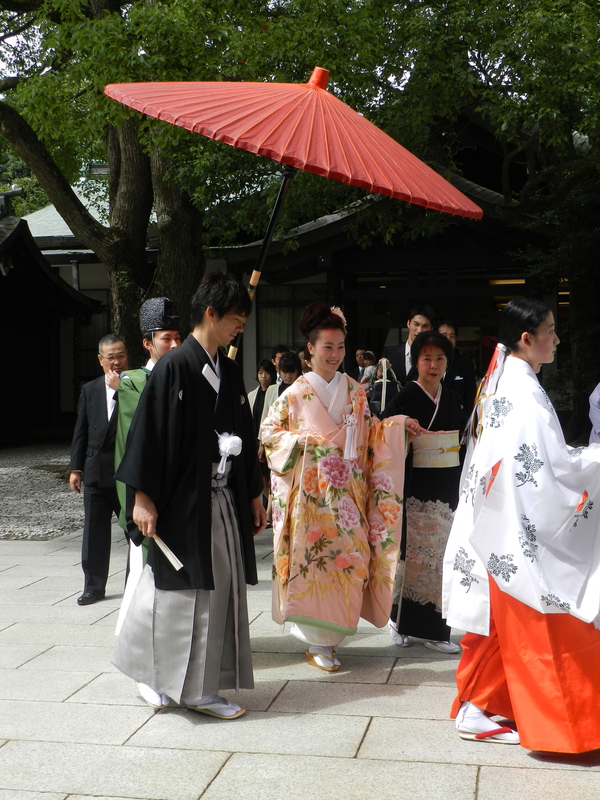 A Summer Wedding- The Bride is wearing a colored Kimono. The female miko- shaman or priestess-lead the way while an elated new mother in law assists the bride. Once the priests join the procession, I`m teetering from the tree limbs to watch unencumbered by the other picture snapping tourists. Japan is the only place outside of the US Pacific Northwest where it is acceptable to wear socks with sandals. Although I`m not apt to wear the traditional zori, (Traditional sandals always worn with socks) the Priests` clogs are tempting for achieving that long-legged look. Not all days are created equal if one wants to follow the Japanese tradition. The days marked “Taian” on the calendar are lucky and auspicious for weddings while the “Shakku” days are bad luck- all day. Other days are marked as bad luck in the morning but not the afternoon, good luck part of the day, etc. During a Taian day at Meiji Shrine, the constant number of wedding processions appear to be marching off an assembly line. After chasing the procession into the shrine, I get a little something to eat in preparation for the next phase. There`s so much fodder on which to elaborate it`s hard to focus my thoughts- the black formal kimonos, pictures of deceased parents, the solemn faces. In a mixed marriage, one would assume the non-Asian portion would be lamenting the loss of a relative to the distant country of Japan while the Japanese contingent would be celebrating an institution in serious decline and causing the population to drop. However, as is the habit, the Western half grins as if on a Broadway audition while the Japanese side peers out stoically. 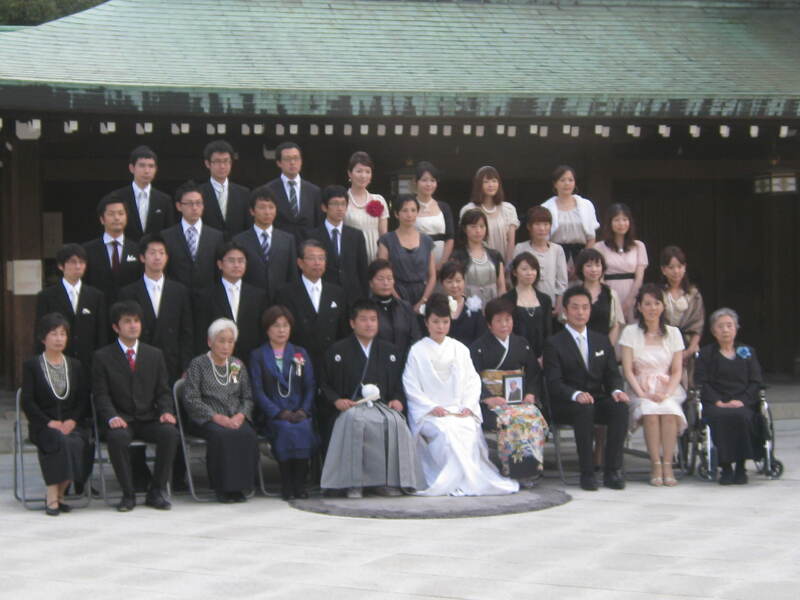 Although I`ve not yet secured an actual invitation to a Shinto wedding, I have managed to participate in unexpected ways. On a recent trip to a small shrine known for its lanterns, the Social Chairman (she knows everyone from Tennessee to Tokyo) and I stumbled across a mark, I mean couple, sitting for a wedding portrait. The photographer seemed nonplussed by our attentions so we pushed it by moving in closer. Eventually the photographer had enough. In order to relieve himself of our uninvited attention, he motioned us to join in. The groom was thrilled to extend the photo session. We didn`t stay long as he was poised to start beating us with the fan clenched in his hand. Once shooed away, we continued our investigation of the wedding trappings to discover the umbrella. 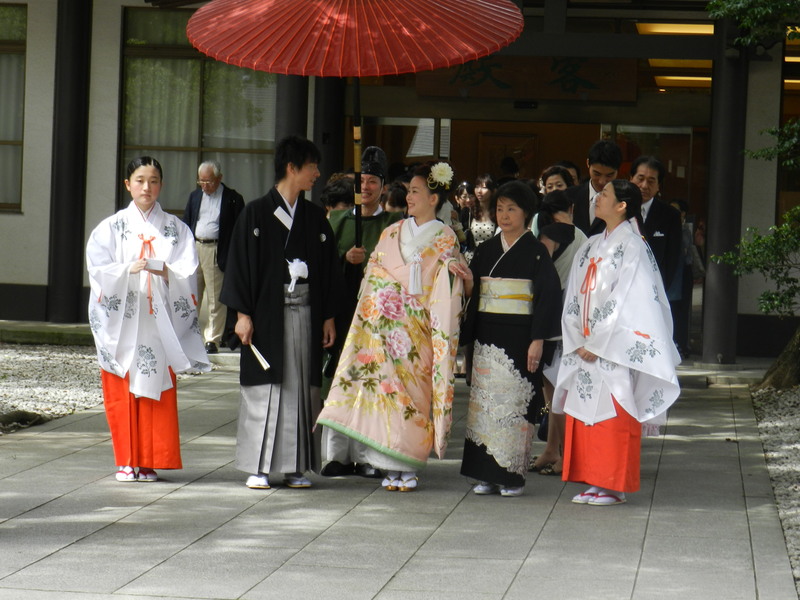 Even the small aspects of the ceremony are interesting much to the dismay of the Japanese watching us take pictures of the umbrella`s underside. 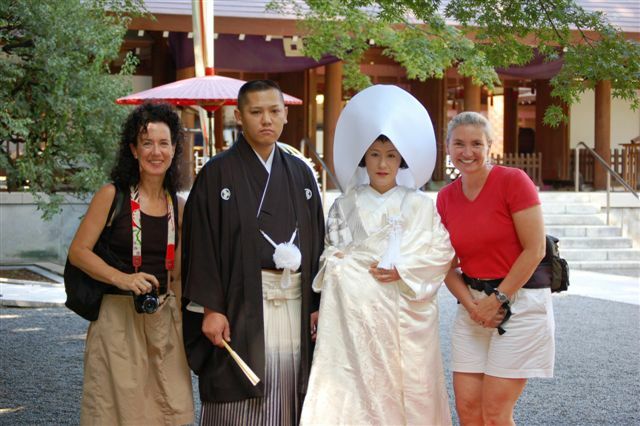 This entry was posted in Moving to Japan and tagged Amblerangel, Bride, Culture, Emily Cannell, ExPat, Groom, Hey From Japan- Notes on Moving, Humor, Japan, Meiji Shrine, Photography, Shinto Wedding, Tokyo, Travel. Bookmark the permalink. Hey D! It is one of the most entertaining things to do here in my book. That is the one thing we didn’t get to see. I’m glad you have the social chairman to stalk the local wedding ceremonies with you. Beautiful pictures! I know- I had plans to do that on Saturday but since we cooked Tgiving dinner instead…. well…. you know. I always have a huge smile on my face when I’m reading your posts; they’re so well-worded and funny 😀 I’m tempted to abandon the traditional Indian dress I must put on at my wedding (whenever it may be) for a gorgeous kimono like the ones here! Ah thanks PM! That makes my day! The Indian weddings are also beautiful! I`m friends with an Indian family that owns a restaurant and they invited me to their daughter`s wedding- I was in awe! Beautiful outfits, and I love the difference between us Westerners and the serious Japanese. Not sure how it happened, but we have all been brainwashed in having to smile on photographs, I suppose it’s natural, at least for us. I cannot imagine not smiling, unless I’m doing it for a reason, like my author/blog photo where I want to look moody in a mysterious way. Loved the photo of you posing with the couple too. Agree on your comment about Indian weddings, beautiful clothes too. Yes- why is that that we feel the need to smile? I`m going to try and look more intriguing by not smiling from here on out. Great post, Emily. How funny that you even got a photo with the bride and groom. By the way, they wear socks with flip-flops in Vietnam, but the socks are like mittens for your feet. Sometimes I wear socks with my flip-flops just to hear Sara mock my efforts to be Asian. Sad, isn’t it? And culturally insensitive, I suppose. Kathy- I hate to say it, but in Ky I`m sure Sara isn`t the only one laughing! I love all of these images. I only went to one wedding (including all the ceremonies) while I was there, but I wish I was a clever wedding stalker like you. Maybe you can find something else to stalk over there? Loved the doughnut post! I cold stalk donuts, but then I would turn into a giant ball of pudge and people would start taking pictures of the incredible talking whale. hahaha I am laughing Lisa! I also think it extends to the other Asian countries. I have a Korean friend who is always making fun of her parents in pictures for not smiling- and they smile ALL the time- unless in a picture. The kimonos are stunning. They look like works of fine art. Are they as impressive in person as they are in the photos? Your stalking techniques are impressive. I bet you can extend this to other facets of your life – if you can get me into George Clooney’s Lake Como estate, I would happily send you a lifetime supply of gum (or something equally awesome). The kimonos are even more striking in person. 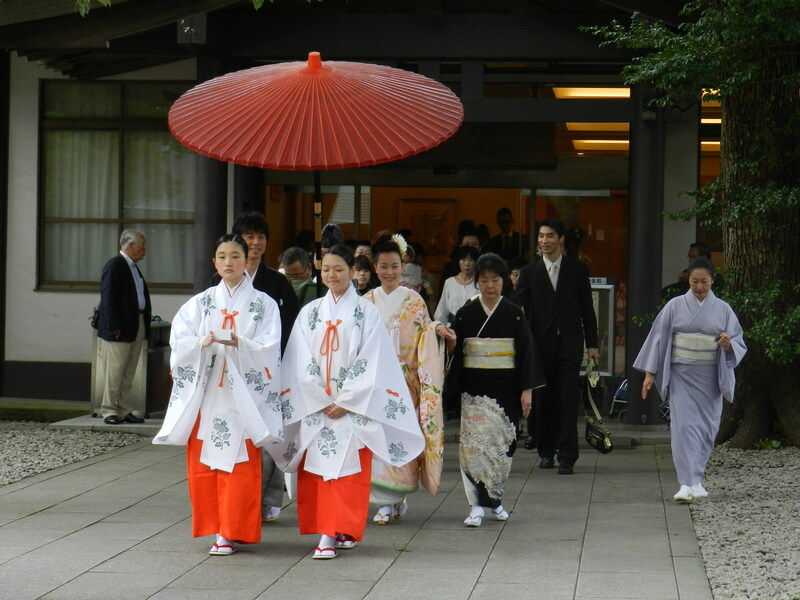 In the photos you can`t tell that there are different fabrics through out the kimono and under garments. The trimmings on the garments, the hair decorations. It`s all just stunning. I`ll try to think of a plan to get you close to Geroge without getting arrested! It is charming to see people of all countries reliving the ancient rites of their particular culture. Part of social anthropology and gives insights to ethos of a people. So true, so true. And one of my favorite pastimes. I vote a definite Yes! 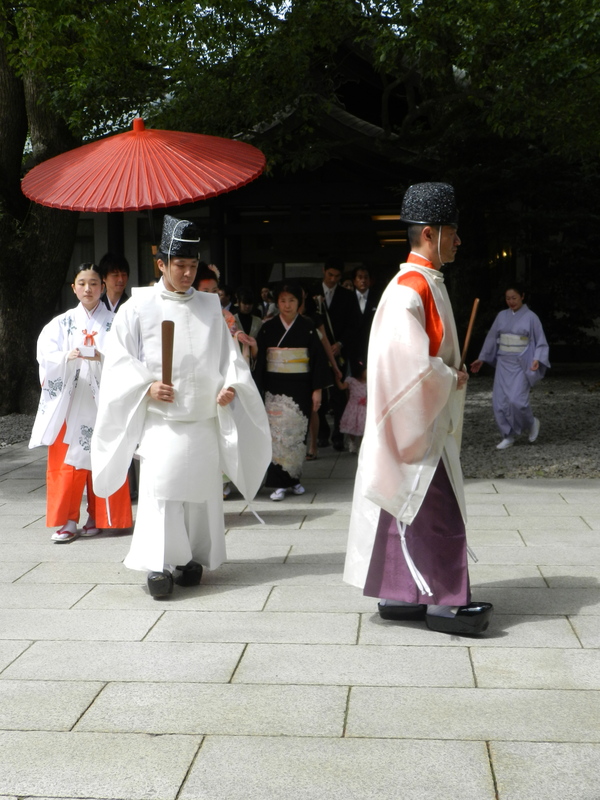 on the Shinto-style vowel renewal. Also, could you dig a little and offer some posts on Shinto religion, traditions, and lore. Hey there- yes that`s a great idea! There are so many things to write about when it comes to the Shinto practices. Haha– love that you were able to capture the mixed wedding photo. The Westerners definitely look a little goofy in comparison to the mysterious Japanese, no? I’ll also have to try being more serious in future photos, if that particular wedding picture is any indication of how dorky I look to other people in my shots! Yes- I`ve decided serious is the way to go. Look for it in future photos of me. I feel the need to be more mysterious. Love this. I’m going to my first South African wedding tomorrow. I hope it’s as blog-worthy as a Japanese wedding! Would love to see that! I hope to see something soon…. 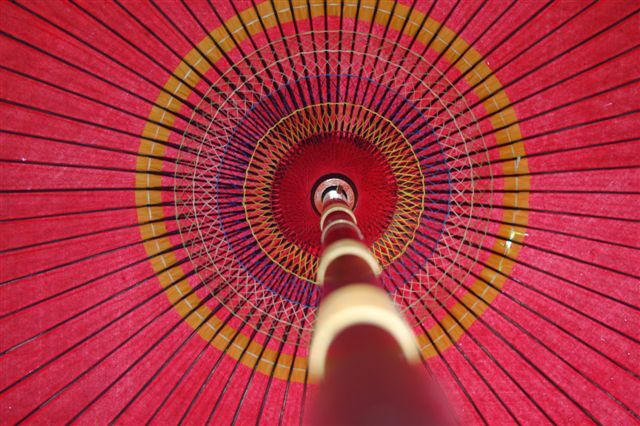 I love this post, Emily, especially the photo of the underside of the umbrella! Hey Wendy! And welcome back. Thanks for the link- I too think the Indian weddings are fantastic. I just can`t get enough of these! Beautiful photographs! Who pays for the two weddings – maybe that’s why the bride’s family look so sombre? Having photos of dead relatives in the wedding photos is a little odd. But then I’ve just experienced my mother’s strange photographic display, which makes the Japanese custom seem normal! You and Heather (2Summers) have a lot in common – did you see her recent wedding crasher post? I did see that. Her wedding looked very lively! 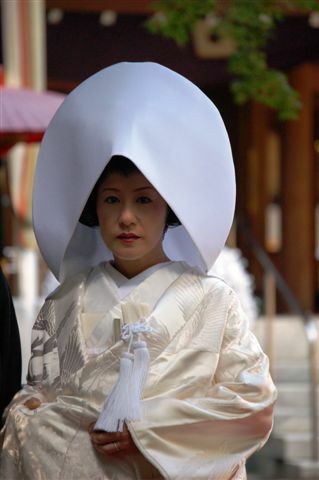 The bride pays apparently….it sounds like many women now are opting for the white dress wedding instead of te traditional Shinto wedding. Ahahaha! 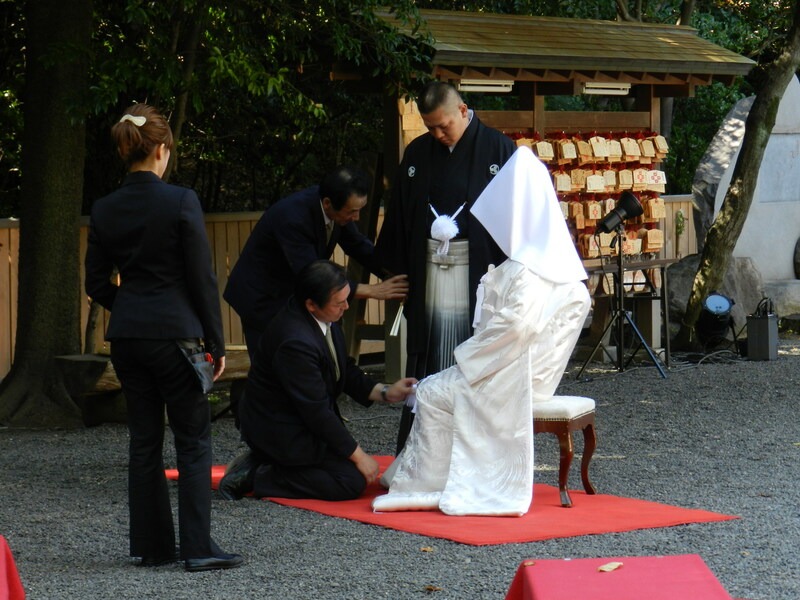 As soon as I started reading this post, I thought of suggesting you renew your vows with a Shinto celebration, so that last line was even more of a kicker. You really should, the posts including all of the preparations leading up to day would be so much fun to read. 😉 I love that you were able to get a photo with the couple, the groom’s expression is classic! Spouse would be wearing the same expression no doubt!I`d probably look more like the grim reaper in white.